Unfortunately, as I have mentioned before, Aoki does not share his techniques. Perhaps the constant rejection I face when searching online for his recipes is the cause of my attraction to them. Chef Aoki is playing hard to get, and it’s working. I had figured out a recipe for these black sesame éclairs two weeks ago when I posted my detailed éclair tutorial (more like a book, really). 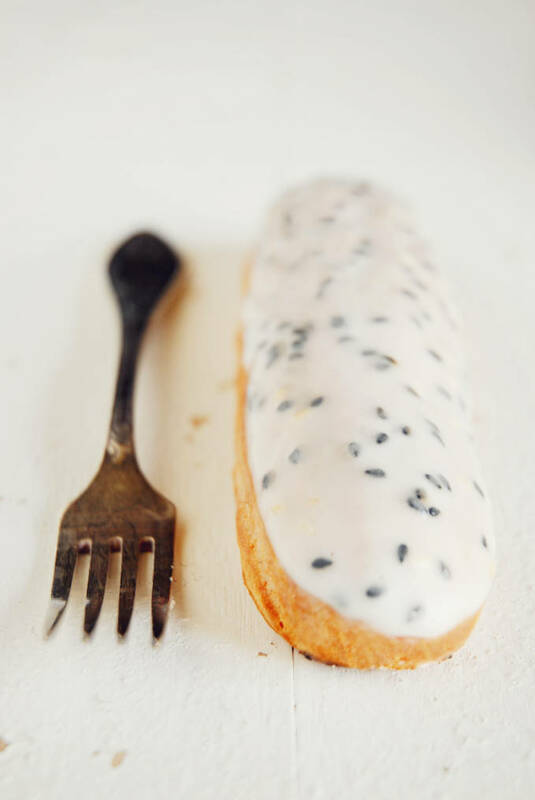 In fact, there are a couple of photos of the black sesame éclairs in that article. 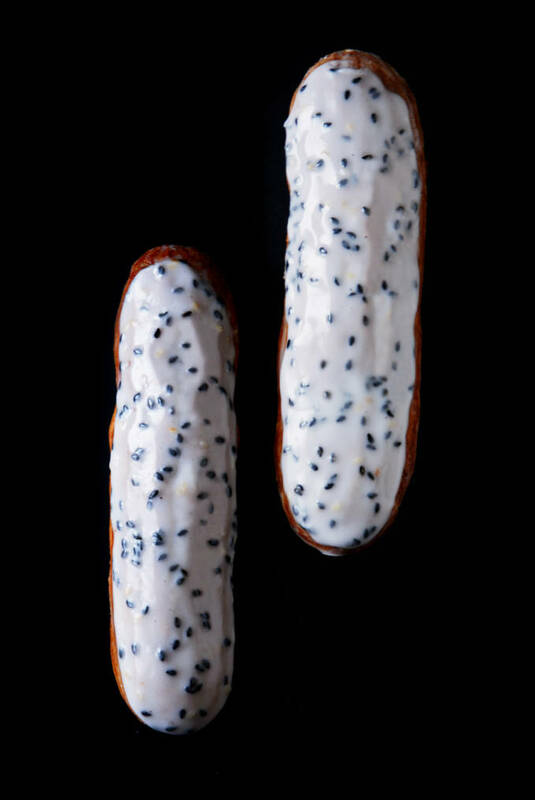 That tutorial, however, focused more on the technique behind a great éclair while today’s discussion is specifically about Aoki’s black sesame version. To make these éclairs, I started by making some standard éclair shells with the meticulously-tested pâte à choux (choux paste) recipe I shared two weeks ago. If you’re planning to make these éclairs, or any éclairs, I highly recommend that you read that post. There are a lot of detailed tips in there (gathered from a plethora of sources and my personal experiments) that will help you achieve perfectly browned, lightly crisped, and hollow éclairs. You’ll no longer have to deal with the disappointment of seeing, or eating, ugly, pale, and cracked ones ever again. Actually, that’s not true. Failclairs are everywhere. 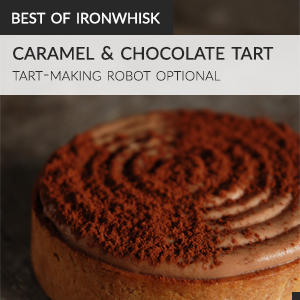 While the shell is unflavoured, photos suggest that Aoki incorporates black sesame into his popular creation in two ways: the crème pâtissière (pastry cream) and the poured fondant glaze. Black sesame seeds are often sprinkled onto foods as an afterthought in the Western world (think bagels), but in Japan they are rightfully showcased. The nutty, smoky, and sweet flavour of toasted and ground black sesame seeds—black sesame seed paste—is unmatched. Although, if pressed, a comparison to homemade almond butter with a splash of liquid smoke isn’t out of the question. Just a few spoons of the rich, black paste can give most anything an impressive recoloring. In this case, an eggy, off-yellow crème pâtissière becomes dark-grey, nutty bliss. In another, macarons become pitch black. The dramatic colour transformation black sesame paste imparts is unparalleled. Cross-sectional photos of Aoki’s éclair, readily available to anyone with an Internet connection (like me), show that his crème filling is not a uniform shade of grey. Within the crème, to add texture, are lightly toasted black sesame seeds. Naturally, Aoki remembers, while many others forget, that the perfect éclair plays with textures. The shell is crisp. The filling is smooth. Together, the two are perfect. 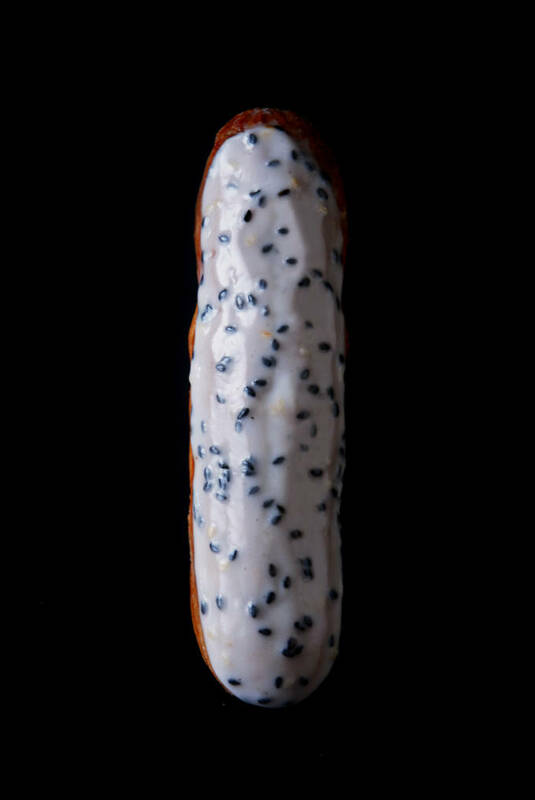 By adding toasted sesame seeds, Sadaharu adds a smidgen more crunch and elevates his éclair to an entirely new level above mere perfection: Aoki. His most famous éclair is crowned with a thin layer of sesame seed-studded poured fondant. Poured fondant is a popular choice for most haute, “designer” éclairs like Aoki’s. Its flavour and colour can be easily adjusted, it dries without cracking, and it is not overbearingly sweet. Excessive sugar can quickly render intolerable an otherwise excellent pastry. Originally, after having found a recipe from Joe Pastry, I had intended to glaze these éclairs with poured fondant (essentially whipped sugar syrup that is left to harden and then heated until fluid with a sugar syrup—this is not like regular fondant, which is gummier). However, the first time around I did not cook the sugar solution long enough and I ended up with a glaze that never hardened. The second time around, I broke my food processor because I had left the sugar solution to cool for too long. At that point, I ditched the poured fondant idea, which necessitated a particular Goldilocks temperature I did not have the patience to find, and settled for a simple icing sugar glaze. I reverse engineered the recipe for Sadaharu Aoki's legendary black sesame éclairs, one of the highest rated pastries in Paris. Bake in a preheated oven at 180°C (350°F) for forty minutes, or until slightly darker than golden brown. Bring the milk, half and half, and the scraped vanilla bean to a simmer in a large saucepan over medium heat. Turn off the heat, cover, and let infuse for one hour. Then, remove the vanilla bean and bring back to a simmer. Meanwhile (during the second simmer), whisk together the egg yolks and sugar in a large bowl until combined. Sift in the flour and cornstarch and whisk until smooth. Slowly drizzle the warm milk mixture into the egg yolk mixture, whisking constantly to ensure the eggs do not curdle. Pour the mixture back into the large pot and, over low heat, cook, whisking often, until well-thickened. Transfer to a container, cover with plastic wrap to prevent a film from forming, and let cool completely in the fridge. Toast the sesame seeds separately in a large pan over high heat, without oil, for three minutes, constantly mixing. At about the two minute and thirty second mark you should hear popping. Remove from heat and cool completely, also separately. Grind the toasted black sesame seeds (that are meant for the paste), oil, and sugar in a food processor until smooth. Whisk together the pastry cream, black sesame paste, and the toasted black sesame seeds until smooth. Using a large, round piping tip poke three equally-spaced holes into the bottom of each éclair. Then, place the piping tip into a pastry bag filled with the black sesame pastry cream. Insert the tip into the holes and press until you feel some resistance, being careful not to add too much cream to burst the éclairs or too little such that they are dry. Combine the toasted sesame seeds in a small bowl. In a wide, flat bowl combine the icing sugar and water such that you get a thick glaze (much more icing sugar than water); I just played around with the quantities until I got a good thickness. Sprinkle in some of the sesame seed mixture, as needed (you won't need all of it). Dip the éclairs in the glaze and wipe away any excess glaze with your fingers. For more details about how to do this (along with how to make the shells), please see my éclair tutorial. I’ve Never been brave enough to try anything with black sesame seeds let alone bake with it. These make me want to try them out! wow these look awesome! love the black sesame idea… Definitely will be trying this recipe. Thanks! I made these eclairs this weekend and the toasted black sesame seed flavor was a hit with some guests. I have a few questions though. Your pastry cream recipe contains very little sugar. I added an additional 45 g to bring it up to what I felt was adequate sweetness. Second, how exactly did you grind up your toasted sesame seeds with the oil and sugar. At first I tried my Vitamin, but that didn’t work very well (quite surprisingly). Next I tried a small electric mini chopper that seemed to do the job, but in the end it was very gritty, not a nice smooth paste. If I had put the mixture in my food processor, the volume wouldn’t have been enough for the blades to really bite into. So I’m curious how exactly you did it. Final question, have you tasted the original pastry by Aoki? I used a chopper (a mini food processor), which worked quite well. And no, I have not tasted the original! Have you? Is it amazing?! ?